Isn’t this Christmas Tree Shelf so cool? I want you guys to build this with me! If you follow me on Instagram and Facebook, you’ve gotten some sneak peaks of the project I’m working on right now with The Home Depot for their DIY Workshops. DIY Workshops are so much fun! If you’ve never been to one of Home Depot’s DIY Workshops, here’s the low down… 10 bloggers around the country (including me) work on the same project- this Christmas Tree Shelf- then we all share each others’ fun projects so you guys. You can see all the different spins we’ve put on our projects and get some fun ideas. 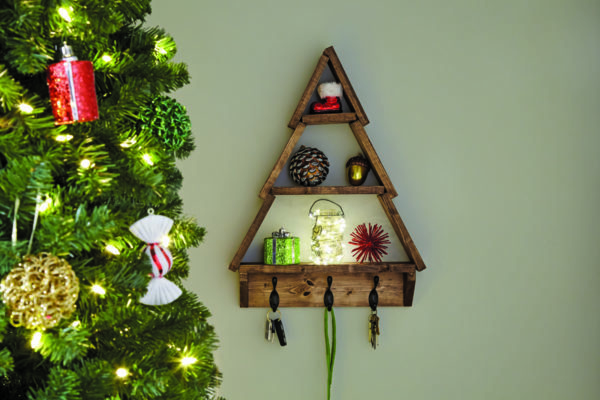 For this DIY Workshop, we are making this cute Christmas Tree Shelf. I have seen these before and wanted to make one, but just haven’t gotten around to it. Isn’t it so cute? I just love it! This would be so fun to do with all of my sisters- such a fun and different girls-night-out idea. All of us bloggers are going to be sharing our finished projects next Monday, the 13th, so make sure to check back and see what the finished project looks like! I know you guys want to make this too! Space is limited, so make sure you register here. This workshop is held on Saturday, November 18th at 10:00 am. Ok, let’s recap. I’m going to be joining some fun bloggers around the country as we all work on this same project. We’ll each build the same Halloween candy holder, but we’ll put our own little spin on how we build them and decorate them, and then you guys will be able to go into your local store on Saturday, November 18th at 10:00 am and do the exact same project we did. Make sure you sign up for the workshop (sign up here) because space is limited.